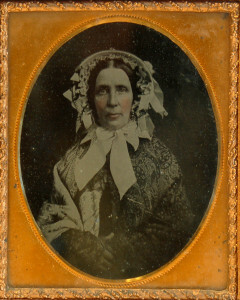 Hannah (Abbott) Harding (1800 – 1870) was the wife of John Harding, a grocer and liquor agent (appointed by the town to buy and sell intoxicating liquors) with a store under the Baptist Church. She lived after 1852 in the old Pearson/Punchard house, now numbered 33 High Street. Her daughter Hannah Harding (later Mrs. N. Farrington Flint) born in 1840 and a member of Abbot Academy’s Class of 1856, later ran a school in the High Street house. A niece remembered that Hannah’s husband John burned his arm in the store on December 29, 1860, while drawing spirits.